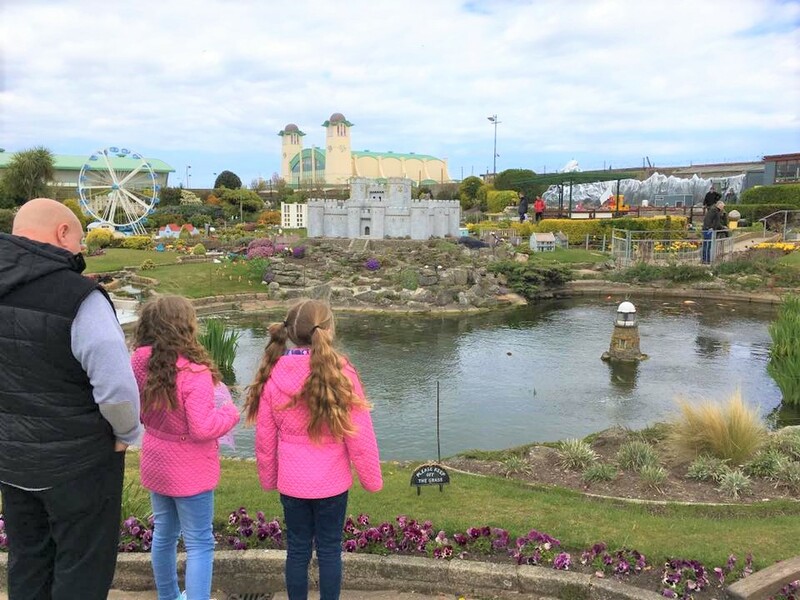 Take a stroll along Great Yarmouth's bustling seafront and you will find Merrivale Model Village. 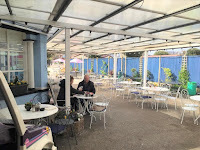 Situated to the south of Wellington Pier, Merrivale first opened back in the 1960's, coming under current ownership on 2004. We headed over after lunch and found a parking space in some of the free parking off Marina Parade. There is plenty of paid parking along the seafront too. 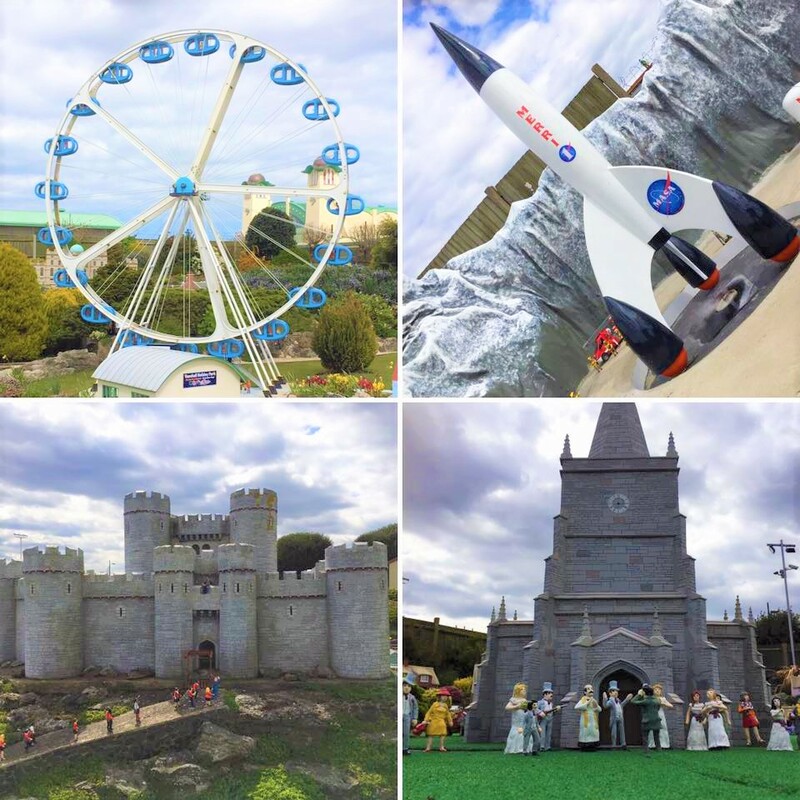 Merrivale Model Village is open daily from 25th March - 29th October 2017, times vary throughout the season and you are best to check opening times before you go. We went into the admissions office and once we had sorted our tickets, the lady stamped our hands. This gives free re entry all day so you could come and go as you wished. Merrivale Model Village also offers Season Passes. The lady who served us was very friendly and cheerfully told the girls about the quiz. 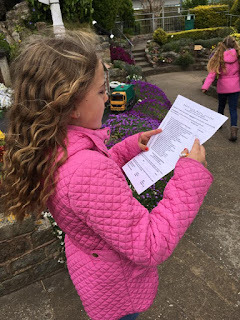 We do love a quiz/treasure hunt when we go places and Mollie took charge of this. As we stepped through into Merrivale Village we were welcomed in by the tranquillity and prettiness of the place. 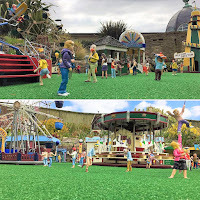 The whole place has a nostalgic feel and we were soon enjoying spotting the characters and seeing the different goings-on around us, all in miniature form. Not only is there attention to detail in the models (which were well looked after) the layout leads you easily around the village, making sure you don't miss a thing. The pathways keep you on track and are accessible for single pushchairs and wheelchairs. 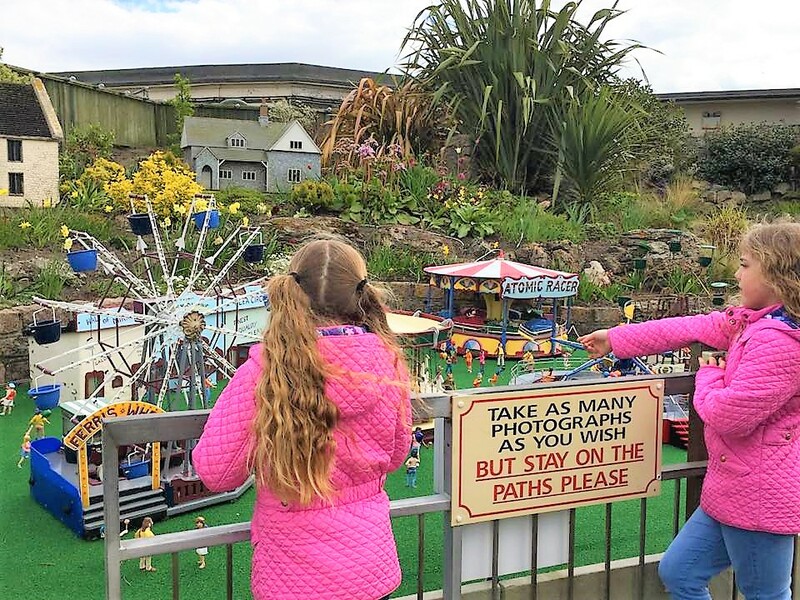 Young and old alike will enjoy the peaceful stroll as they take in the sights and spotting the little comical features hidden in the displays. There have been new additions over the years, in 2016 the village saw the arrival of Merrivale Eye, a miniature version of Great Yarmouth's own "Eye." There's been a couple of new additions this year too. 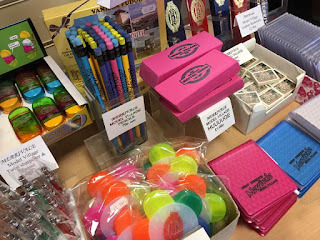 I'll not detail them here as you need to go and check them out for yourself. Many of the attractions had push buttons which the girls raced to press to activate a motion or audio. 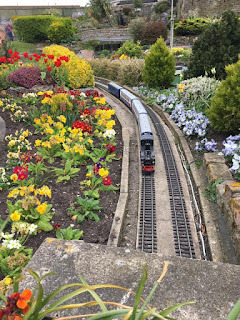 This added a great fun element, as did watching the model trains as they chugged their way along the 350 metres of rail and through the pristine flower beds and beautifully tendered gardens. 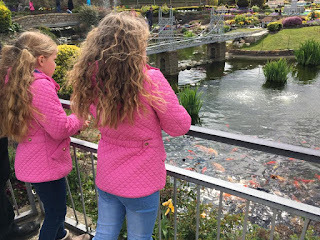 We continued our way round and spent some time feeding the Koi in the central pond. Just by this you can buy a handful of feed for 20p and there are plenty of fish to feed, some real beauties in there! From here we found the travelling fair. Much like Great Yarmouth's own annual fair with rides, music, lights and candyfloss there's definitely a good atmosphere at this fair too! There is a housed model on display, this is in it's own building and the whole room is dedicated to the Royals. 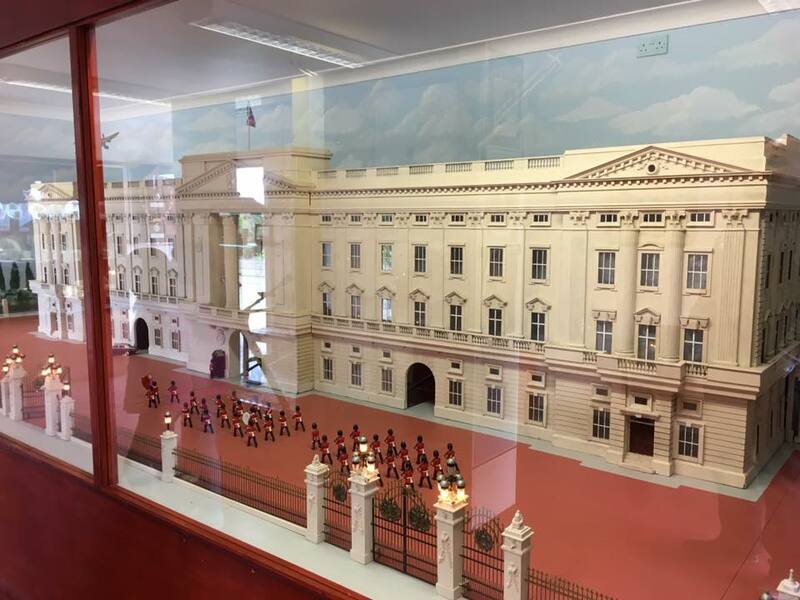 A stunning model of Buckingham Palace is displayed behind glass and there are replica Crown Jewels and Royal memorabilia from over the decades. We really enjoyed it in here, having recently been to see Buckingham Palace in London. The model is very detailed and is not to missed. Part of your ticket price includes playing the 9-hole crazy golf. This is situated between the entrance and the Tea Rooms and has picnic tables running alongside it. As you leave the village via the gift shop make sure you hand in your completed quiz sheet, children in the group are rewarded with a hard boiled lolly pop and entrants are put into a draw to win a Family Season pass. The gift shop has plenty to browse and a great, what I'd call, pocket money section for kids. 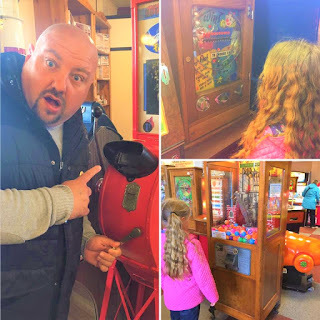 From here you can purchase old penny's to use in the Old Penny Arcade, vintage machine's from the early to mid 1900's, from penny pushers to the Laughing Sailor. 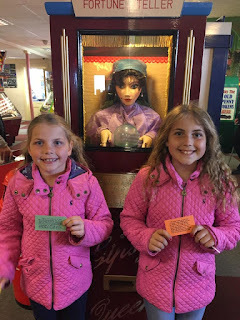 We had a great half an hour playing on these, the girls had their fortune's told by the Palm Reader and have kept their little fortune cards as a keepsake. 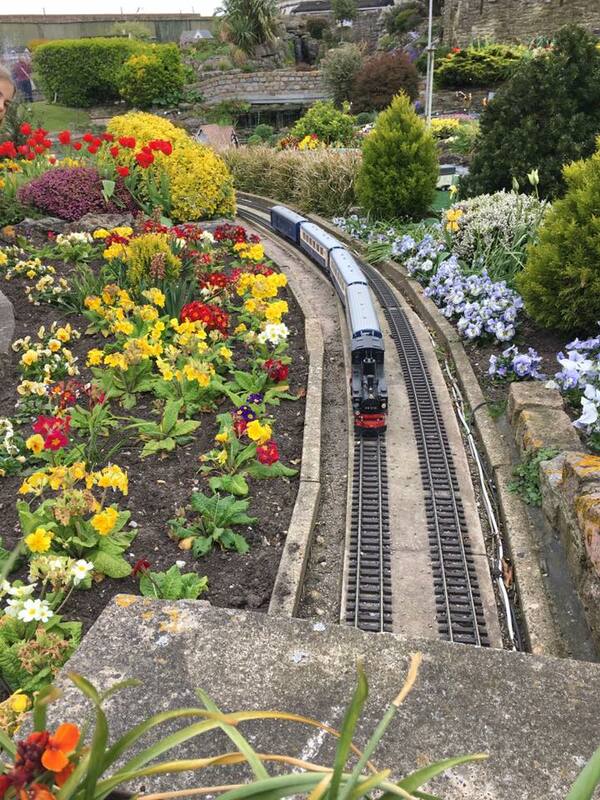 Lastly Merrivale Model Village boasts of it's quaint Tea Rooms, with their scrumptious selection of homemade cakes. 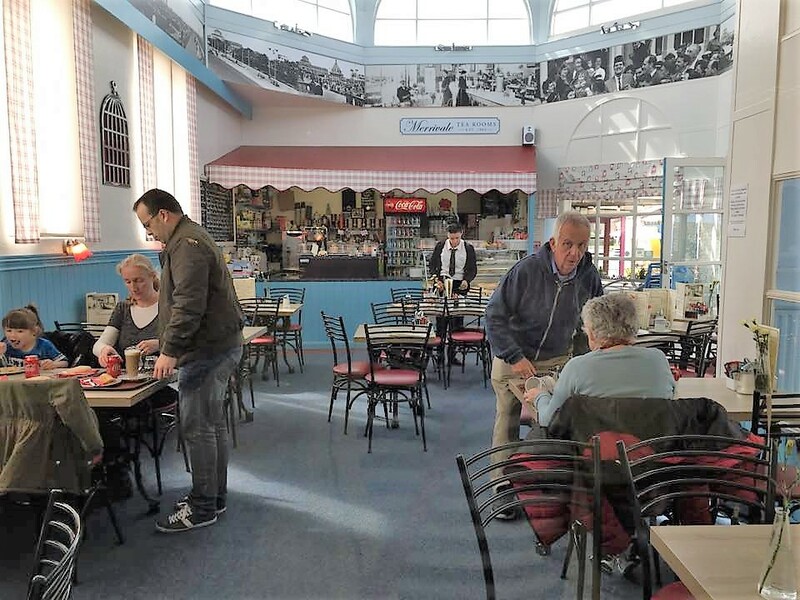 The Tea Rooms opened way back in 1903 and have been serving their delights ever since. 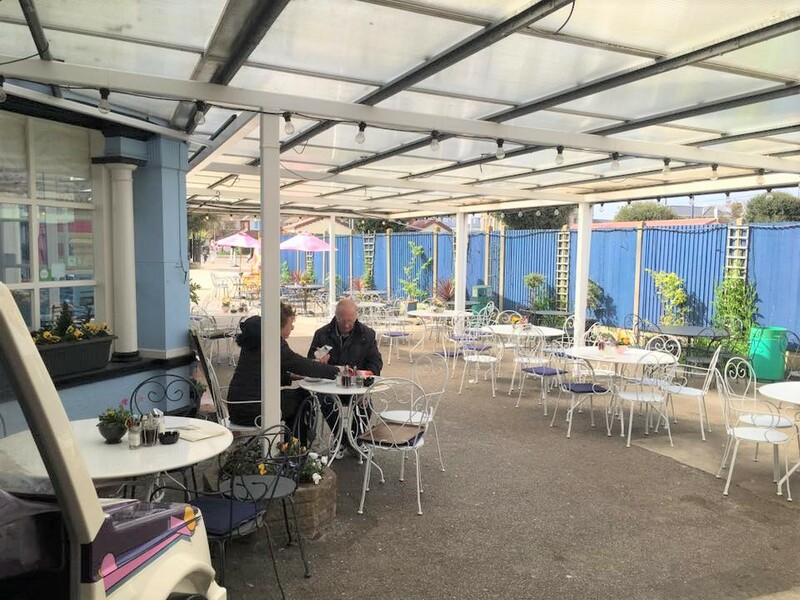 Plenty of seating available indoors and outside. 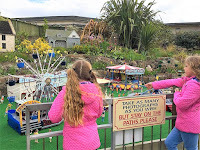 We had a lovely relaxing time at Merrivale Model Village, we spent approximately an hour and a half there altogether. 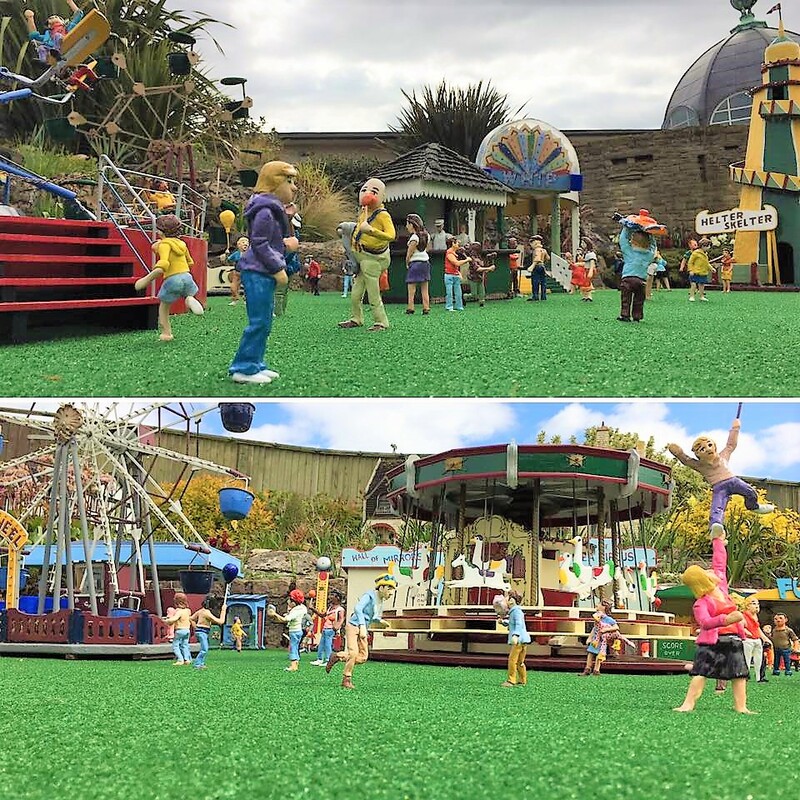 It was a lovely, simple attraction for all ages. 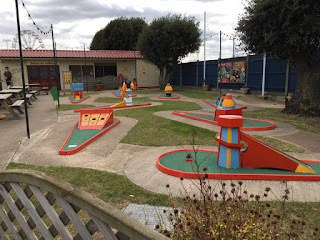 Considering you get all day re-entry and the crazy golf is included in the price I think its fairly good value for money. Make sure you pay a visit this year and see it for yourself. 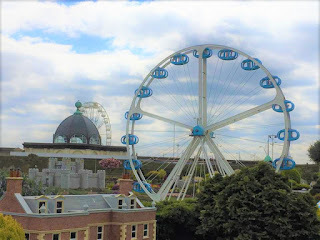 Merrivale Model Village really is a quintessential Great British seaside attraction and I can understand how it has continued to draw visitors over the decades. 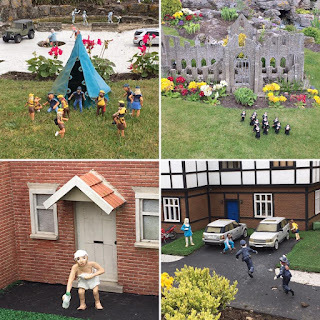 For more information visit the Merrivale Model Village website or find them on Facebook. You'll find offers and events advertised on there too. One of which is the Pre-view day they have each year, usually around the end of March and you can visit for just £2 per person! They also hold Merrivale at Night openings, I imagine that the village would look even more beautiful when lit up in the dusk. Perhaps we'll have to pop back to see it!